1995-06-01. New. Ships with Tracking Number! INTERNATIONAL WORLDWIDE Shipping available. Buy with confidence, excellent customer service! DC / Warner. PAPERBACK. 1852860820 Like New Condition. . Fine. DC / Warner. PAPERBACK. 1852860820 New Condition. . New. DC Comics. Paperback. 0930289455 Please allow 4 - 14 business days for Standard shipping, within the US. Thank you for supporting our small, family-owned business! . Fine. 1995-12-01. Graphic Novel. DC Comics. Paperback. 0930289455 Please allow 4 - 14 business days for Standard shipping, within the US. Thank you for supporting our small, family-owned business! . New. 1995-12-01. Graphic Novel. New York: DC COMICS, 1988. Bound Comic/Digest. Illus. by BOLLAND, BRIAN. Near Mint. Comic. 1st Edition. Comic (Square Bound) - 7th. Print (Yellow Color Embossed Logo on Cover) CGC Slabbed and Graded 9.6 (NM+) White Pages - Alan Moore's legendary take on The Batman - The Joker shoots and cripples Barbara Gordon (Batgirl), kidnaps The Commissioner (her father), and then attempts to drive him insane. - A modern comics classic!!!. DC / Warner. Paperback. 1852860820 Please allow 4 - 14 business days for Standard shipping, within the US. Thank you for supporting our small, family-owned business! . New. 1988-01-01. First Edition. 1995-06-01. Good. Ships with Tracking Number! INTERNATIONAL WORLDWIDE Shipping available. May not contain Access Codes or Supplements. May be ex-library. Shipping & Handling by region. Buy with confidence, excellent customer service! 2008-03-04. Good. Ships with Tracking Number! INTERNATIONAL WORLDWIDE Shipping available. May not contain Access Codes or Supplements. May be ex-library. Shipping & Handling by region. Buy with confidence, excellent customer service! 2008-04-04. New. Ships with Tracking Number! INTERNATIONAL WORLDWIDE Shipping available. Buy with confidence, excellent customer service! DC Comics. PAPERBACK. 0930289455 Like New Condition. . Fine. DC Comics. PAPERBACK. 0930289455 New Condition. . New. DC / Warner. Paperback. 1852860820 Please allow 4 - 14 business days for Standard shipping, within the US. Thank you for supporting our small, family-owned business! . Fine. 1988-01-01. First Edition. 1988-05-05. Good. Ships with Tracking Number! INTERNATIONAL WORLDWIDE Shipping available. May not contain Access Codes or Supplements. May be ex-library. Shipping & Handling by region. Buy with confidence, excellent customer service! New York: DC COMICS, 1988. Bound Comic/Digest. Illus. by BOLLAND, BRIAN. Near Mint. Comic. 1st Edition. Comic (Square Bound) - 7th. Print (Mustard Color Embossed Logo on Cover) (NM) Alan Moore's legendary take on The Batman - The Joker shoots and cripples Barbara Gordon (Batgirl), kidnaps The Commissioner (her father), and then attempts to drive him insane. - A modern comics classic!!!. New York: DC COMICS, 1988. Bound Comic/Digest. Illus. by BOLLAND, BRIAN. Near Mint. Comic. 1st Edition. Comic (Square Bound) - 2nd. Print (Pink Color Embossed Logo on Cover) (NM+) Alan Moore's legendary take on The Batman - The Joker shoots and cripples Barbara Gordon (Batgirl), kidnaps The Commissioner (her father), and then attempts to drive him insane. - A modern comics classic!!!. New York: DC COMICS, 1988. Bound Comic/Digest. Illus. by BOLLAND, BRIAN. Near Mint. Comic. 1st Edition. Comic (Square Bound) - 5th. Print (Blue Color Embossed Logo on Cover) (NM) Alan Moore's legendary take on The Batman - The Joker shoots and cripples Barbara Gordon (Batgirl), kidnaps The Commissioner (her father), and then attempts to drive him insane. - A modern comics classic!!!. New York: DC COMICS, 1988. Bound Comic/Digest. Illus. by BOLLAND, BRIAN. Near Mint. Comic. 1st Edition. Comic (Square Bound) - 6th. Print (Orange Color Embossed Logo on Cover) (NM+) Alan Moore's legendary take on The Batman - The Joker shoots and cripples Barbara Gordon (Batgirl), kidnaps The Commissioner (her father), and then attempts to drive him insane. - A modern comics classic!!!. New York: DC COMICS, 1988. Bound Comic/Digest. Illus. by BOLLAND, BRIAN. Near Mint. Comic. 1st Edition. Comic (Square Bound) - 8th. Print (Light BlueColor Embossed Logo on Cover) (NM+) Alan Moore's legendary take on The Batman - The Joker shoots and cripples Barbara Gordon (Batgirl), kidnaps The Commissioner (her father), and then attempts to drive him insane. - A modern comics classic!!!. New York: DC COMICS, 1988. Bound Comic/Digest. Illus. by BOLLAND, BRIAN. Very Fine. Comic. 1st Edition. Comic (Square Bound) - Scarce Newsstand Edition - Note: 6th. Print stated, but 1st. Newsstand (Orange Color Embossed Logo on Cover) - (VF/NM) Alan Moore's legendary take on The Batman - The Joker shoots and cripples Barbara Gordon (Batgirl), kidnaps The Commissioner (her father), and then attempts to drive him insane. - A modern comics classic!!!. New York: DC COMICS, 1988. Bound Comic/Digest. Illus. by BOLLAND, BRIAN. Near Mint. Comic. 1st Edition. Comic (Square Bound) - 2nd. Print (Pink Color Embossed Logo on Cover) (NM) Alan Moore's legendary take on The Batman - The Joker shoots and cripples Barbara Gordon (Batgirl), kidnaps The Commissioner (her father), and then attempts to drive him insane. - A modern comics classic!!!. DC Comics. Paperback. 0930289455 Please allow 4 - 14 business days for Standard shipping, within the US. Thank you for supporting our small, family-owned business! . Fair. 1995-12-01. Graphic Novel. Penguin Random House, 2008. Hardcover. New. DC / Warner. Paperback. 1852860820 Please allow 4 - 14 business days for Standard shipping, within the US. Thank you for supporting our small, family-owned business! . Fair. 1988-01-01. First Edition. 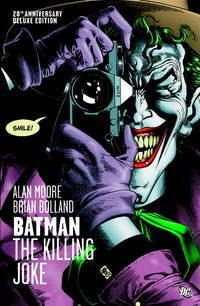 Alan Moore - Batman The Killing Joke, Deluxe Edition - Hardback. Book. BRAND NEW. New York: DC, 2008. Graphic Novels. Illus. by Brian Bolland. Fine. Hardcover. Later Printing. A square solid tight clean near new copy.very carefully read copy. The 17.99 jacket has some light rubbing else fine. Compilation edition containing material originally published as Batman: The Killing Joke 1988 and Batman: Black and White 1996. A very nice copy. THIS COPY IS IN MY POSSESSION AND NORMALLY SHIPS NEXT DAY..
DC / Warner, 1988-01-01. Stated First Printing. Paperback. Good. New York: DC, 2008. Graphic Novels. Illus. by Brian Bolland. Near Fine. Hardcover. Later Printing. A square solid tight clean near new copy.very carefully read copy. This copy has a small see through type stain to the top edge of the text block. The 17.99 jacket has some light rubbing else fine. Compilation edition containing material originally published as Batman: The Killing Joke 1988 and Batman: Black and White 1996. A very nice copy. THIS COPY IS IN MY POSSESSION AND NORMALLY SHIPS NEXT DAY..
New York, NY, U.S.A.: DC Comics, 2008. Unknown Printing. Hard Cover. NEW/NEW. Bolland, Brian (illustrator). Brief summary of content available upon request by e-mail. NOTE - Product is brand new and in shrink wrap. Very Good. Ships SAME or NEXT business day. We Ship to APO/FPO addr. Choose EXPEDITED shipping and receive in 2-5 business days within the United States. See our member profile for customer support contact info. We have an easy return policy. DC / Warner. PAPERBACK. 1852860820 . Very Good. DC Comics. PAPERBACK. 0930289455 Item in acceptable condition including possible liquid damage. As well, answers may be filled in. Lastly, may be missing components, e.g. missing DVDs, CDs, Access Code, etc. . Fair. DC Comics. 2008. good+. Paperback. for mature readers. originally published 1988; corners bumped . DC Comics. Very Good+ with No dust jacket as issued. 1988. First Edition. Softcover. A clean gently read comic or multiple comics showing only slight shelf and edge wear . VeryGood. Ships Within 24 Hours M-F- Satisfaction Guaranteed! Has a publisher overstock mark. Item is in Good Condition. Clean Copy With Light Amount of Wear. Acceptable. Has a publisher's remainder mark. Book is in great shape, however it has no dust cover. Book reads fine but has significant wear, dings, and jacket tears.